Even with these high summer temperatures, 94 airman pedaled across Iowa as part of the Registers Annual Bicycle Ride across Iowa, or RAGBRAI, which began July 21. Air Force members gather the day before the Register’s Annual Great Bicycle Ride Across Iowa at Council Bluffs, Iowa, July 20, 2013. For the Air Force, the RAGBRAI gives airmen a chance to showcase the service’s fitness culture and recruit for enlisted and civilian positions in the Reserve, guard and active duty. (photo by Staff Sgt. Abigail Klein). Staff Sgt. Abigail Klein, 931st Air Refueling Group, writes that the Air Force Cycling Team, under the leadership of Senior Master Sgt. Larry Gallo, 433rd Airlift Wing, Joint Base San Antonio-Lackland, Texas, started their trek at Council Bluffs, and by week’s end, biked more than 400 miles across Iowa. One of the longest rides of the seven-day event took place July 22, and was dubbed “The Century.” Airmen biked approximately 100 miles from Harlan to their daily stop in Des Moines. They wore team jerseys complete with the Air Force symbol on their backs. RAGBRAI is the oldest and largest recognized non-competitive bicycle ride in the nation, according to the Air Force. It attracts more than 10,000 riders worldwide. “This is largest ride in the U.S. Some days we have 25,000 riders. It’s a great opportunity for the Air Force to get their message out,” Gallo said in a news release. The airmen who participate in RAGBRAI volunteer their personal leave to participate, and fund their equipment and transportation for the chance to cycle on the Air Force team. This is the 19th year the Air Force has participated as a team in the cycling event. 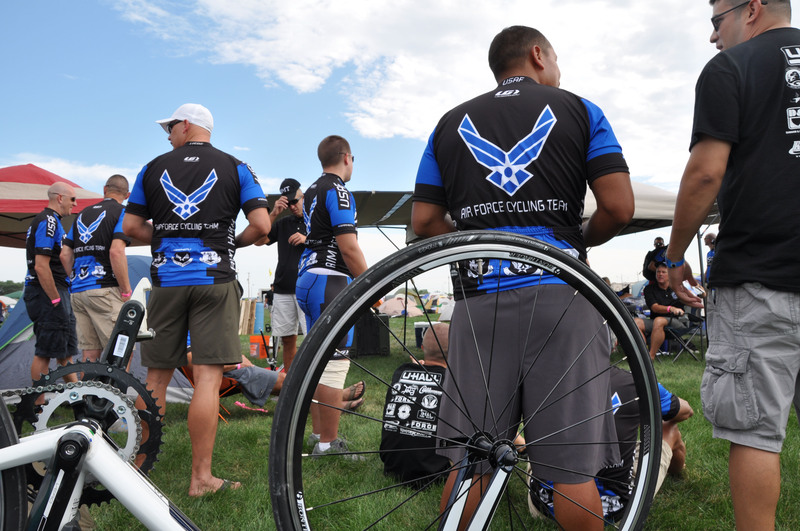 Air Force Cycling Team membership is open to all reserve, Guard, active duty, retired and civilian airmen and members of their families.